Tap Room at Gold Dust West Elko has Elko’s only Self-Serve Beer Wall. Enjoy burgers made your way, sandwiches, pizza or one of the dinner entrees. 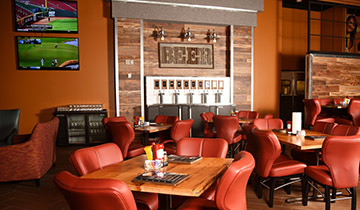 Come in to grab a quick bite to eat or to watch your favorite sporting event on our large screen TVs. Unwind with our Happy Hour: ½ price appetizers and ½ price beer wall Monday-Thursday 4pm to 6pm. The perfect ending to a delicious meal? Indulge in a sweet treat from our Tap Room desserts. Join the select band of winners who have taken the challenge and completed eating the Fridge menu item within 30 minutes. This special food item contains 3 8oz. Patties, 6 slices of bacon, 4 pieces of Texas toast, and your choice of side dish. Complete it all and get a Free T-Shirt and you photograph on the winners wall! Louisiana style mini Po-Boys with crispy shrimp, remoulade, diced tomatoes and shredded lettuce. Prime New York strip Street Style tacos. Topped with cabbage, Pico, queso fresco and avocado sour cream. Classic Caesar served in a crispy parmesan bowl and topped with Grilled Chicken and soft pretzel croutons. Barbecue Chicken pizza Los Angeles style. With grilled chicken, barbecue sauce, red onions and cheese. Cheese sauce, Philly meat, grilled pepper, onion, mushroom and mozzarella cheese. We realize that they have no pro teams, BUT they have great pizza! Covered in tomato sauce, pineapple, ham, bacon and mozzarella cheese. Gyro Inspired pizza with gyro meat, olive oil and garlic sauce, cheese, tomatoes, shredded lettuce and Tzatziki sauce. Three 8oz. beef patties, three slices of cheese, six pieces of thick slab bacon, and four slices of Texas toast. Topped with secret burger sauce, lettuce, tomato, onion and pickle. If you can finish "The Fridge" you get a free t-shirt. Juicy patty topped with smoked pulled pork with a Carolina honey mustard bbq sauce and fresh slaw. Juicy patty topped with fried cheese curds, crispy onions and beer cheese sauce. Juicy patty piled a mile high with sautéed mushrooms, onions and melted Swiss cheese. Traditional Philly cheese steak with grilled onions and Cheese Whiz on a Philly roll. USDA Prime sirloin served open faced on a hum bao roll. Topped with Japanese style slaw, Yum Sauce and Tempura onions. Smoked Pulled Pork with a Korean inspired Gochujang BBQ sauce. Served on a steamed hum bao roll with spicy Kimchi. All shakes served in a souvenir Tap Room helmet. Vanilla ice cream, vodka, creme de cocoa, peanut butter sauce and chocolate syrup. Championship delicious! Tuesdays from 6am to 10pm. Members 50 years and older who earn 50 points on their Gold Rewards Club card, will receive 50% off any regular menu item at the Grille. Visit the kiosk for your offer.